Oh, print, you have a problem. When Henry Blodget presented the current state of media, he noted that ad spending by media channel is out of sync with how consumers really spend time in each format. Everyone understands that mobile ad spending is trailing consumers’ love affair with smartphones and tablets (because marketers are still figuring mobile out), but … what about print? 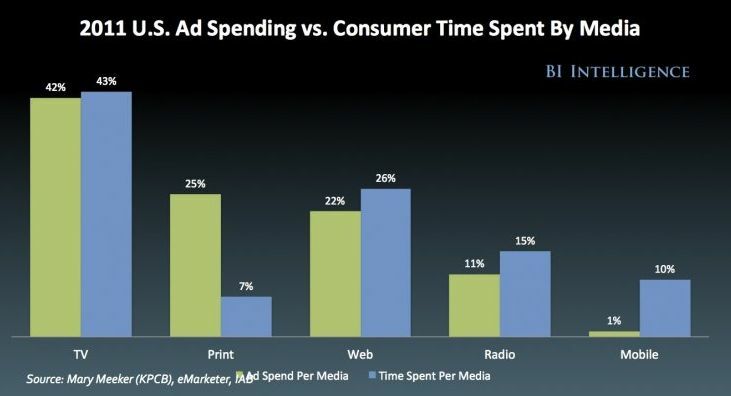 Print ad spend and consumer attention are wildly out of sync. In 2011, only 7% of U.S. consumer media time was spent in magazines and newspapers, yet 25% of U.S. ad spend flowed through paper. Newspapers have already faced an advertising correction — ad spend adjusted for inflation is down about 70% from the all-time high in 2001 — but that shift was driven primarily by Craigslist and Google sucking classified advertising revenue out of the back of newspapers. Newspaper and magazine display ads are still over-represented in ad spending vs. audience attention. One reason for this misalignment is print ads often outperform TV, radio, digital and mobile in terms of response rates and cost per response; better return justifies a higher ad rate. This may seem counterintuitive, but we recently explained in a Digiday column that response rates for TV and radio hover around 0.05% to 0.13%, about that of banner ads, simply because so many ads are pushed to consumers each month. The typical U.S. consumer is hit with about 6,600 TV spots or 750 radio commercials every four weeks — how many do you respond to? Print ads, by comparison, last longer, stick around the house, and can be revisited. Declines in ad spending in print channels aren’t driven, so far, by declining response rates but instead by slipping circulations. The real problem for print is what will happen if response rates start to slump as well. Mobile could drive that; advertisers are starting to figure out the handset and tablet game with geo-fencing, app advertising, native ads, and Facebook (which can finally provide real mobile audience targeting based on all that information you’ve volunteered in your FB profile). If mobile finally wakes up, the market may reset with ad spending aligned with consumer time. Not that this really matters for advertisers; the demarcation between digital tablets and paper print is starting to look silly, and eventually “screens,” “audio” and “reads” may be how we define media plans. But for publishers who live by the value of paper, fair warning: consumer attention is slipping away.